Recently I’ve decided to embrace my proximity to Red Rock Canyon. This is no small feat for this city guy. A couple weeks ago I grabbed a cup of Dunkin Donuts coffee and a donut (yes, that’s lunch sometimes) and drove into the desert to clear my head and get away from things. I’ve only driven into Red Rock Canyon a couple times even though I’ve lived nearby for almost 2 years (2 years!). About 5-10 minutes driving into the canyon area I found a scenic overlook. I don’t remember this being here before but it was a nice area. There are picnic tables (some covered) if you decide to actually bring your food out for a meal. There’s a helipad if you don’t have the patience to drive 30 minutes from the Vegas strip. Bike riders were the only people making use of the rest rooms. Last but not least there is no Verizon data access so there are no emails, texts, tweets or Facebook to disturb you from the tranquility of the desert and the rocks. Nearby there’s a 13 mile scenic drive that will allow you to drive closer to the mountains where you’ll probably see some rams and burros. The drive costs $5 and has areas to pull off so you can take pictures. That seems like a good deal for $5 but I’m not sure I need that. Driving in the middle of nothing for 13 miles isn’t quite up my alley. While it’s still nice out (and not 115 degrees) I’ll continue my lunches at the scenic overlook. It’s calm, pretty and very different then what I’m used to. I dig it. I took a bunch of pictures of the scenic overlook picnic area and the scenery. You’ll get to meet Big Red somewhere in this slideshow. Enjoy. Yesterday it was announced that Resorts World Las Vegas would open in 2016. The renderings show a very impressive complex when construction is complete. The construction is supposed to be done in phases so don’t expect the casino to look like the renderings on opening date. In February I mentioned that the SLS Hotel may have begun construction on the land where Sahara once lived on the Vegas strip. SLS Hotel is scheduled to open in 2014. I still haven’t seen or heard a peep about construction progress and remain skeptical but they did make this snazzy sales video. 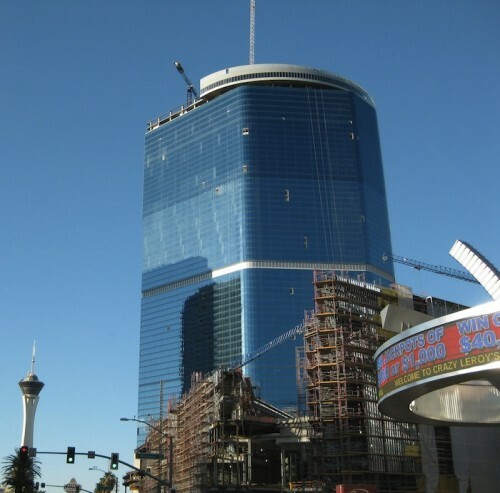 The Fontainebleau (above) remains a shell of a hotel today with no plans of opening. Since the bones of construction are completed I have to imagine that once construction is visible at both SLS Hotel and Resorts World we’ll begin to see movement on Fontainebleau. That movement may with Fontainebleau be in the form of a sale first but the revitalization of the north Vegas Strip looks very real. The development of the north Vegas strip may be 10 years in the making but there is reason to believe that the Vegas strip will, once again, continue beyond Wynn. Thursday, Caesars Entertainment came forward and confirmed that they will, indeed, be adding a resort fee to the price of their hotels in Las Vegas. No big surprise there. Read their quote below to find the surprise from Gary Thompson, Caesars Entertainment’s director of corporate communications. His job is to spin every message to the media so that it’s seen as a positive. According to Mr. Thompson, Caesars customers asked for the resort fee to be added on to their room fee. How about that?! Has a customer ever asked to pay more for something? No. I’m surprised that Caesars statement to upset customers would be a lie like this. If it’s not a lie, I’d like to see proof. I don’t get bothered by resort fees because I care more about the bottom line on the room fees. Any business has the right to charge what they want for their product or service. I also have a right not to buy that product or service. If I don’t like the final hotel room prices at Caesars properties I’ll book elsewhere. It’s not like Caesars owns all of the hotels in Las Vegas. I don’t appreciate Mr. Thompson lying about why Caesars added resort fees but I’m more offended by the poor housekeeping at Caesars hotels. Don’t forget, if you’re offended by resort fees but still want to stay on the strip there’s always Casino Royale. Las Vegas is like no other place in the world in every way for better and worse. Now that Caesars Entertainment has added resort fees to their hotel rooms it means that all but hotel one Vegas strip hotel has a resort fee. As I’ve said for years I’m more concerned with the final cost of my hotel room than a resort fee. With that in mind let’s look at the anatomy of what a hotel room will cost in Las Vegas. Room Fee – This is what is advertised as a your Las Vegas hotel room cost. Resort Fee – This is hidden and not part of the advertised fee. Sometimes you’ll only see this when you make final room reservations (This happened to me recently at the Silverton…THE DAMN SILVERTON!). Taxes – Vegas strip hotels add 12% tax to your bill. In order to get the actual price of staying a night in Las Vegas you’ll have to add the advertised room fee + resort fee x .12 for taxes. Here are resources to find out what you’ll be paying for your next Las Vegas hotel room. Expedia – Compare Las Vegas hotel room costs. Vegas Chatter – Find the resort fee. Calculator – Multiply .12 for tax to the fees above. I love me some math! Enjoy! Taxi drivers in Las Vegas have been ripping people off for years. It’s not really a secret and it looks like the government is finally going to do something about it. Last week they set up check points to see how many taxi drivers were long hauling passengers from McCarran Airport and here’s what they found. It’s a small sample size and that number is less than previously estimated. Most people that were pulled aside for this didn’t want to press charges against these crooked taxi drivers. They just wanted to get to their hotel. They’re on vacation…in Las Vegas…who wants to waste more time in a taxi? I wouldn’t. That’s where the taxi drivers get you. They know you want to go have fun and you want to get to it as quick as possibly. If you’ve never been to Las Vegas before you won’t even know that 3-5 minutes is being added to your drive and if you’ve been to Las Vegas before you likely won’t care about the extra few bucks because you just want to go have fun. If you find that you’re overcharged by a taxi driver and don’t feel like dealing with it at the moment because you’re on vacation, that’s fine. Just do two simple things and deal with it when you get home. Take pictures of your taxi and your driver. The more complaints that are submitted the sooner the government will do something about this. Think of this as paying it forward so someone else doesn’t get ripped off by these crooked taxi drivers. Believe it or not there’s actually good news from this sting on taxi drivers overcharging customers. Last year estimates on Las Vegas taxi drivers long hauling were much higher than 25%. Some drivers put the percentage of long haul rides at 50 percent or even 70 percent. The truth on Vegas taxi drivers ripping you off is probably somewhere in between the range that were caught last week (25%) and the estimates from last year (50%-70%). That doesn’t make this problem better. It just makes it, potentially, less worse. Note: Not all taxi drivers in Las Vegas are crooked so treat the good drivers well so we can keep them.